WALK-IN this FRIDAY, January 11th: Across the entire state of California union members will be “walking in” to show solidarity with UTLA on Friday morning. Contact your Site Rep for the time and “meet up” location for your site. Be sure to wear your BFT t-shirt or a red shirt, and to help your Site Rep and Contract Action Team to take a fabulous group photo. If you site does not yet have a plan for a walk-in, volunteer to help your Site Rep. This action is a “low prep/high impact” way to show solidarity. RALLY for Public Education on Saturday, January 12th: As you may know, our siblings in Oakland are also possibly headed for a strike (in February). But Oakland’s fight is our fight and we need to show this concretely with our presence. 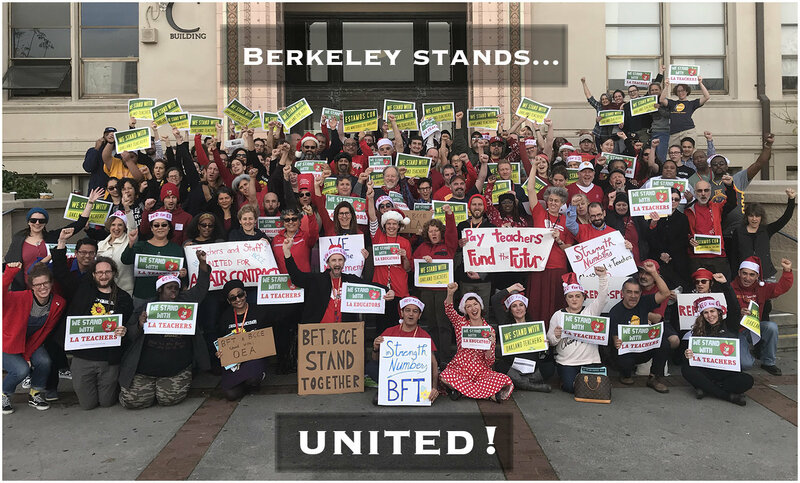 A coalition of East Bay teachers’ unions, including BFT, has planned a RALLY this SATURDAY, January 12th at noon at Frank Ozawa plaza, to stress the need for California, one of the richest economies in the world, to fully fund public education. BFT members are meeting at the corner of 14th and Washington at 11:45 am. This rally will also support OEA as they continue negotiations, and will be inspiring to our siblings in UTLA. Please wear your BFT T-shirts at both of these events and we hope to see you there. BFT members attended and helped plan the December 15th Mass Mobilization Meeting in Oakland to support OEA and organize for statewide action. Workshops included site based organizing, picket support, and community engagement. This workshop is designed for educators approaching retirement but all BFT members are welcome to attend. STRS counselors will explain the basics of STRS retirement, the three decisions to make when retiring, and what you should be doing to prepare for retirement. The meeting will take place January 10th at 4:00 p.m. in the Multipurpose Room at the Berkeley Adult School, 1701 San Pablo Ave. (at Virginia). Teachers who formally notify BUSD in writing prior to February 7, 2018 that they plan to retire at the end of the current school year will receive a $1000 bonus. 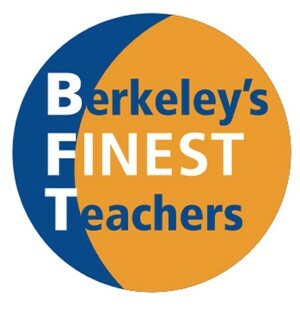 To notify BUSD, teachers should use the Separation/Retirement form available on the BFT website and scan it into an email to Evelyn Bradley at evelynbradley@berkeley.net. We encourage members to make use of this union-negotiated benefit. BFT has put together a brand new FAQ on Negotiations. Topics include our negotiations processes, timeline, communication, proposal development and the contract campaign. Additionally, the BFT Executive Board decided on December 6th to stay with our past practice and CFT best practices in releasing only survey headlines to the Executive Board as needed for proposal development and prioritization. The Executive Board decided that releasing full survey results publicly is not in our members interest. Management can use survey results to divide members and reject proposals. At the December 6th Exec Board Meeting, BFT passed resolutions supporting OEA/UTLA and Transgender Rights. The BFT Executive Board is honored to once again support the Berkeley Martin Luther King Jr. breakfast on Monday, January 21st, 2019. The BUSD Black History Oratorical Fest Competition is designed to uplift Blackness, while providing Berkeley students with an opportunity to shine through public speaking. Students recite original or published speeches and poems by educators, entrepreneurs, government officials, authors, etc. Skits and spoken word are also encouraged. Contact your principal for more information. 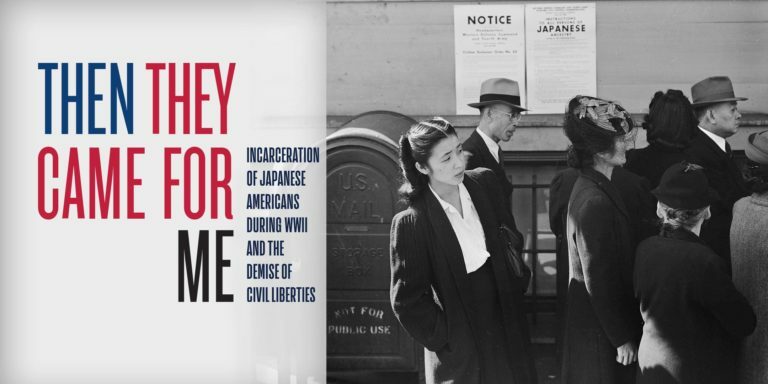 Then They Came for Me: Incarceration of Japanese Americans during WWII and the Demise of Civil Liberties (https://thentheycame.org/) opens January 18, 2019 examining a terrifying time in U.S. history when the federal government scapegoated and indefinitely detained thousands of people of Japanese ancestry, two-thirds of whom were American citizens, and draws parallels to tactics chillingly resurgent today. The workshops provide a backdrop to the exhibit and invites inquiry into this dark chapter in American history. Please vote for up to 3 BFT delegates to the CFT convention. All ballots must be received to the BFT office by 5 pm on January 25th. Ballot forms will be in your school mailbox or mailed to you. Be sure to write your name and signature on the outside of your envelope. Please fill out your ballot and return it to the BFT Office by January 25th. This is an election year for BFT Officer positions. Nominations will go out in March and the election will occur in May. Often times people run as a slate (a group of people running together). Please contact BFT President Cathy Campbell at bft4tchr@lmi.net for more information. Are You Considering a Sabbatical or Leave of Absence for 2018-2019? Eligible teachers who plan to apply for a sabbatical leave or request a full-time or part time unpaid leave of absence for the 2019-2020 school year must notify Human Resources of their intentions by March 1st. Under Article 12.1.2 of the BFT/BUSD Contract, full-time Leave of Absence requests submitted by March 1st are automatically granted. We strongly recommend reading the Sabbatical FAQ and Leave of Absence FAQ for more information. The Sabbatical Application and Leave of Absence Request Form are also available on our website. If you are currently on full or part-time leave you need to notify BUSD of your plans for 2019-2020 by February 1st, 2019. Want To Enroll Your Child In A Berkeley School? Article 21.3 of the BUSD/BFT contract gives you this right, even if you do not live in Berkeley and are part-time. See the "Enrolling Your Child in a BUSD School" FAQ for more important details. The AFT and CFT offer several college scholarship opportunities for children of union members (both high school and seniors and continuing college students). The CFT Raoul Teilhet scholarship applications for high school seniors and college students are due January 10, 2018 and can be found here.